This is the box I made yesterday during my Facebook Live. I was really nervous to craft 'live' for the first time - thanks to everybody that tuned in. I hope you enjoyed it. If you want to catch up you can watch it HERE - I was going to upload this to YouTube but there is quite a big blooper for the first five minutes - I am on my side, luckily the lovely Katrina pointed it out to me and I could fix it. 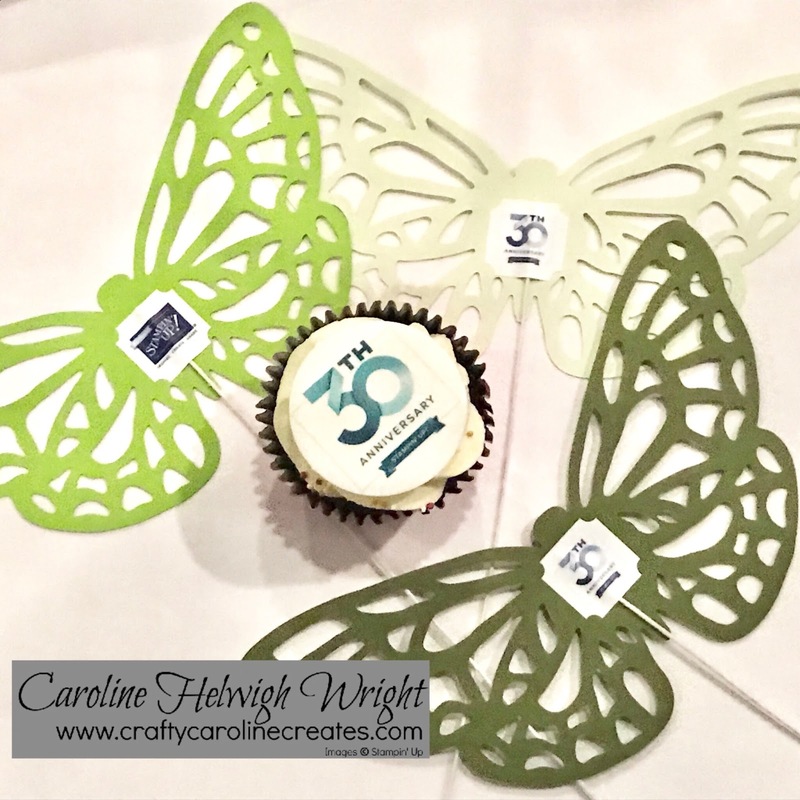 The box is decorated with the gorgeous Cake Soiree stamp set. The Sweet Sugar Plum version was my prototype, I made the Pear Pizzazz version on camera. 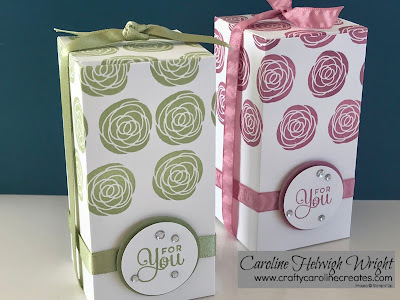 I was half way through stamping when it dawned on me that the roses suddenly looked a lot like cabbages. The lovely Sue suggested they were sprouts and now that is all I can see when I look at this box! What do you see? Sprouts or Roses? Don't forget you will get a FREE swatch set containing every new Stampin' Up colour following the refresh as part of your thank you from me if you spend over £50 in my on-line shop in April. Or you can buy a set for £7.50 - click HERE to sign up. Before I share this beautiful card with you, I want to mention that I will be Live on Facebook at 1pm today, 17th April. We will be talking all things Colour Refresh, Retiring List and New Catalogue plus I might even do some live crafting. 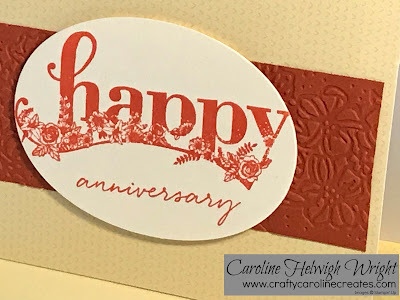 The card I am sharing with you today is one that I made for a lady in my team, the SimplyStylishStampers, who was celebrating her first year as a demonstrator recently. 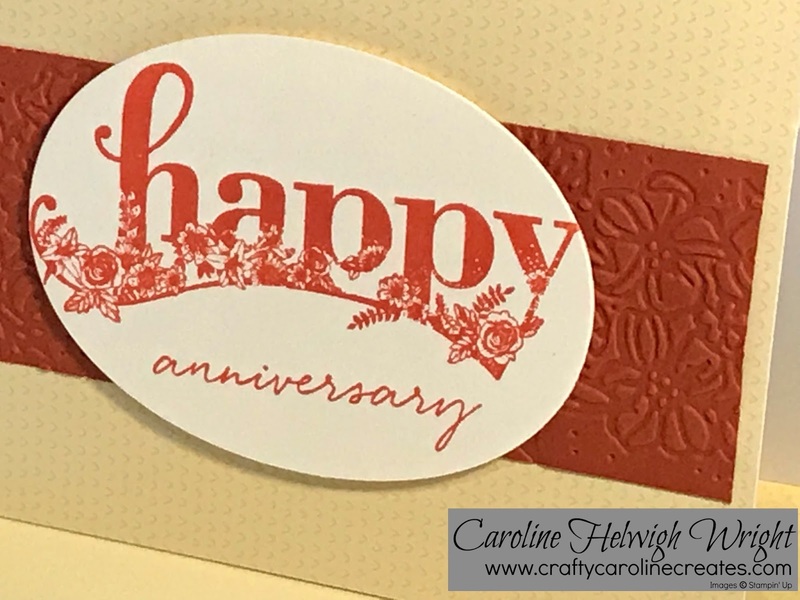 The background is all hand stamped using a range of images from Beautiful Bouquet. I just love this set - I know I have said it before but it really is one of the most versatile in the catalogue. 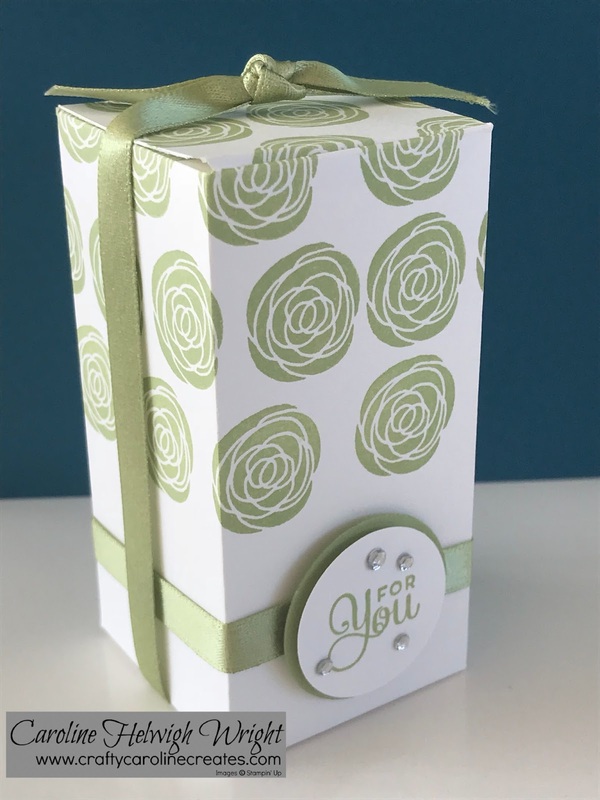 Remember that you can get this stamp set and the matching dies together and save 10% until the end of the May. Also remember that the Large Numbers framelits and matching Number of Years Stamp Set are also retiring at the end of May - they are available while stocks last so don't miss out! Large Number Congratulations Card - Get them before the retire. Have you checked out the list of retiring items yet? I have to admit I was surprised by quite a few items on the list but none more so than when I saw the Large Numbers Framelits on there. That means these very useful dies are now only available while stocks last - if you have your eyes on them, make sure you order them soon. 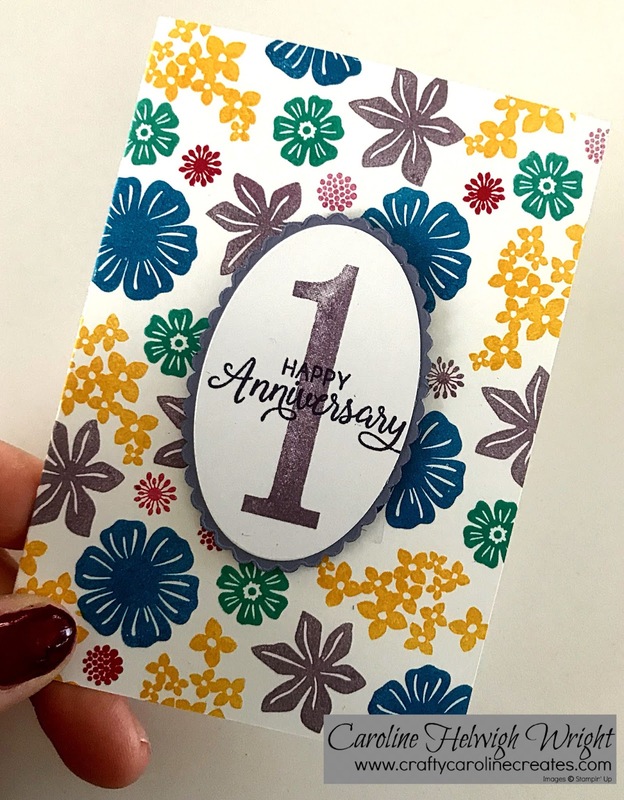 I used those framelits to make this card for one of my team members who was recently celebrating her first year as a demo. I used the framelits to cut out the number one so that the beautiful Myths and Magic glimmer paper really shines through. The sentiment comes from the very popular Petal Palette. I am really pleased that this set is staying with us a while longer. Be aware however that the Petal Palette stamp set and matching dies are only being offered as a bundle with 10% off until the end of May - if you want to take advantage of the saving, make sure you order sooner rather than later. 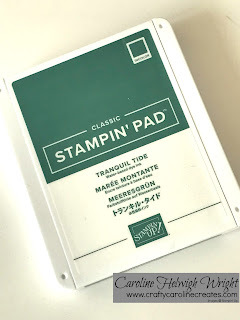 Stampin' Up Colour Revamp, Retiring List and New Ink Pads! One of the best perks about OnStage, the demonstrator event I attended at the weekend (read more about it HERE), is getting the chance to be one of the first people IN THE WORLD to see the brand new Annual Catalogue. Here is the front cover - isn't it beautiful. Would you like to see inside? Join my team today and you can see it straight away! 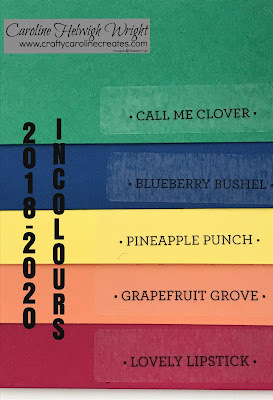 Now to make room for all the new goodies, we need to say goodbye to some old favourites and Stampin' Up have just released the retiring list. Click HERE to view and shop retiring items. If there is something you really want on that list, don't miss out - order today. Everything is while stocks last and popular items will sell out quickly. Now you might notice there are lot of ink pads on the list - all of them in fact. SU isn't going to stop selling ink - nope, we just have a new ink pad design for you. You can see it close up in my latest video HERE. I think they have done a really good job - they have taken a superior product and made it even better! Now for the really big news! This new catalogue also features a colour re-vamp! You can hear more about it in my video HERE. As well as 5 gorgeous new in-colours, the rest of the colour families are getting quite a make over! 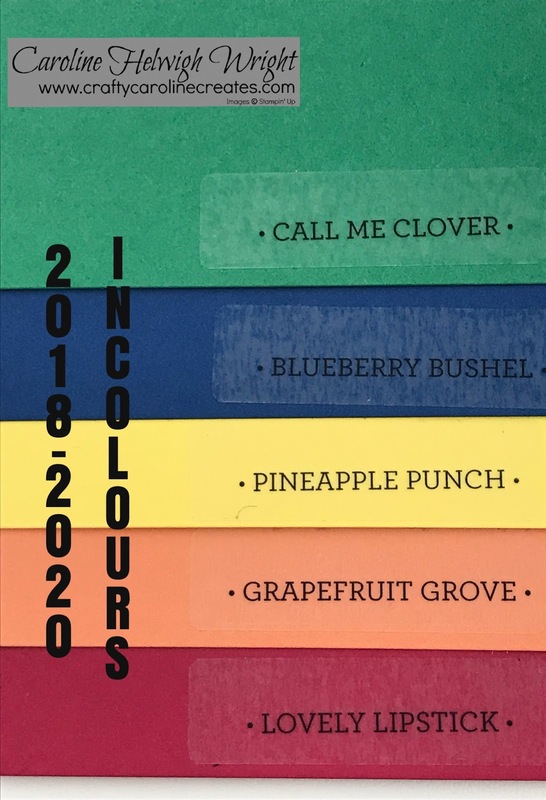 Firstly let me introduce you to those new 2018-2020 in-colours. Yes - there are colours in there! We welcome back Mossy Meadow, say hello to the gorgeous, deep, rich Merry Merlot and my favourite Night of Navy moves over to become part of the neutrals. Basic Black, Whisper White and Very Vanilla form their own, new family of basics. 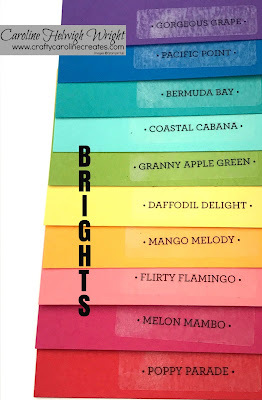 Are you ready to meet the Brights - and yes, they are brighter than ever! Poppy Parade and Coastal Cabana are returning in-colours from before my time - already love them both! Mango Melody, Granny Apple Green and Glorious Grape (at the top) and all new and all beautiful. 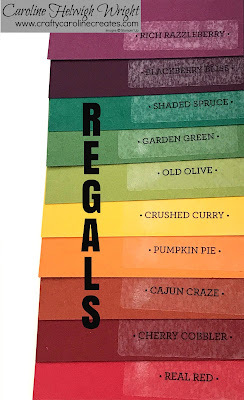 Next Up - the new Regals. Did you spot the return of Blackberry Bliss, hope that made you as happy as it made me! The new Shaded Spruce is really lovely too! Lastly, here are the Subtles, the family that has probably seen the most changes. Mint Macaron is back and the new colours are just perfection. We have needed a baby blue for a while and Balmy Blue is the stuff dreams are made of, I also love Highland Heather and Soft Sea Foam is possibly my favourite out of all the new colours.....just possibly. 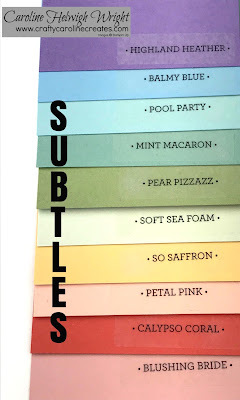 I can also see lots of uses for Petal Pink. 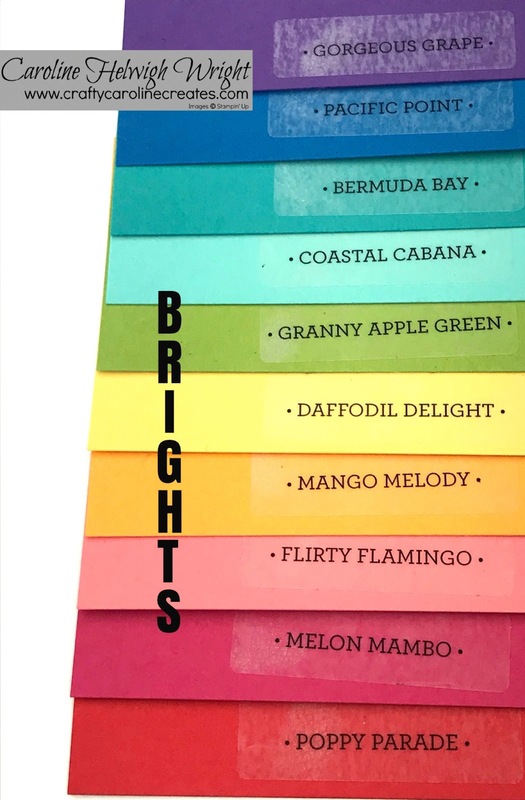 Now of course, all these lovely new colours means some old favourites are retiring - if you love one of these, make sure you stock up quickly. 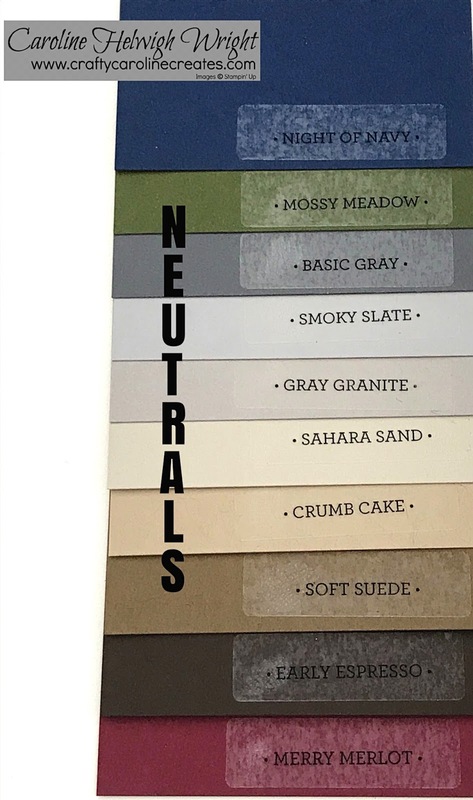 Do you like my color swatch? 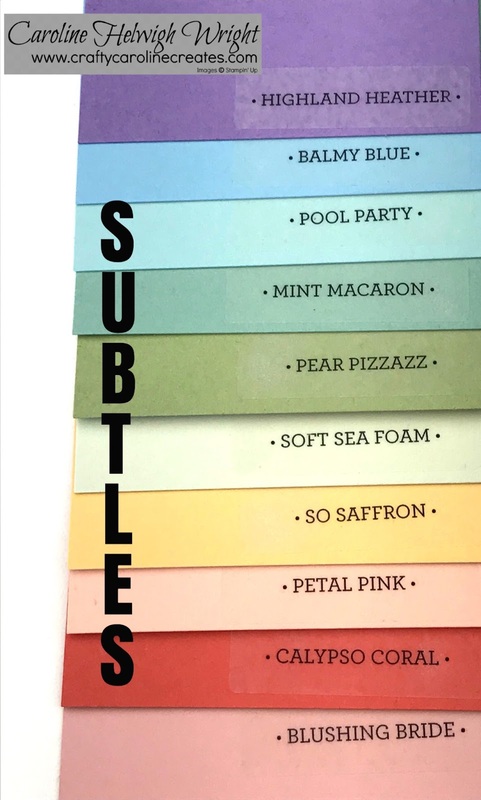 ALL 53 colours in one place. Spend £50 or more with me in April and I will send you one, absolutely free! Or you can buy one for just £7.50 including UK postage (£1 extra is you want it sent to the France, Germany, Austria or the Netherlands). Just fill in the form below and I will send you an invoice. Note - colour swatches will ship in early May. 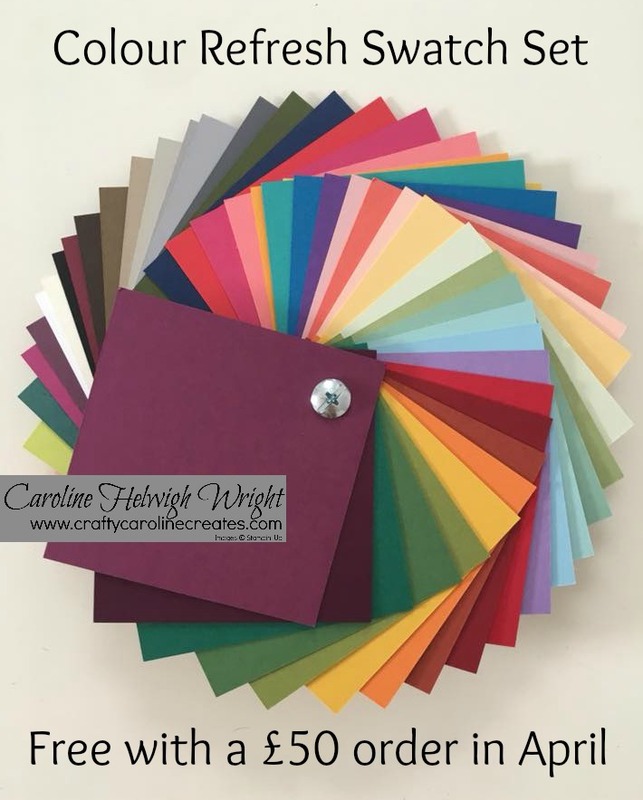 Sign up for a colour swatch pack. OnStage, Retiring List and Changes Are Coming!! I know I have been quite quiet these last few weeks, a combination of a big project in my day job, poorly children and low creative energy have conspired against me. 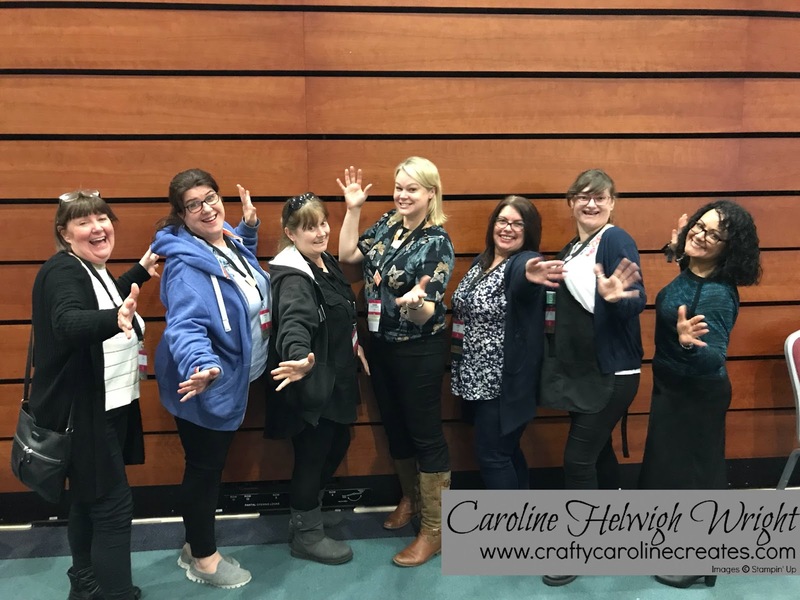 It is fair to say however that after the weekend I have just had, my motivation is sky high again and I am itching to get back into my craft room. I was in Telford for OnStage - Stampin' Up's twice yearly convention for demonstrators. It was a brilliant weekend of friendship, inspiration and crafting. Stampin' Up really spoilt us, I came away with two bags full of goodies and fabulous swaps from my fellow demos - I will share those with you very soon! We also got our first glance of the brand new catalogue which launches on 1st June - it is amazing, I am very pleased and so excited to get my hands on everything. Now of course, whenever a new catalogue comes out, some items need to retire to make space for the fabulous new products. 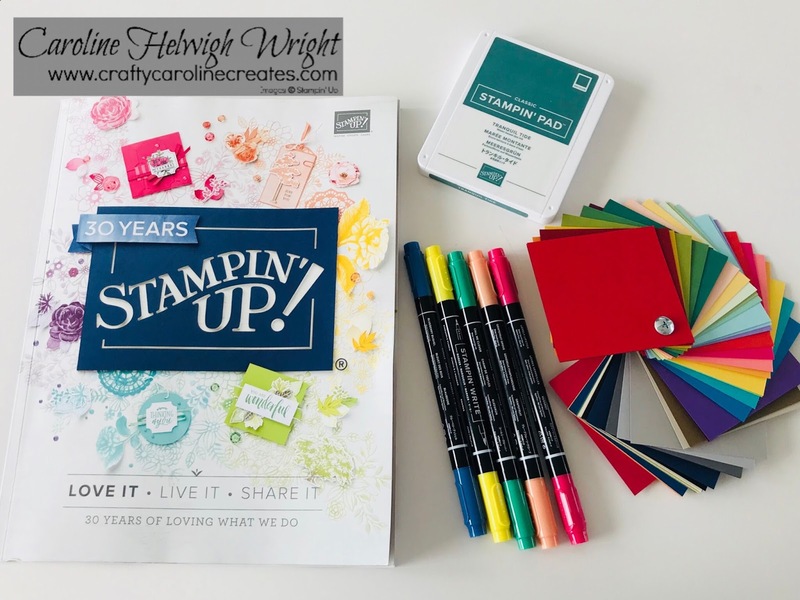 Stampin' Up will release the full retiring list at 8pm this evening. This will be your last chance to buy many of these amazing products - things will sell out quickly so if you have had your eye on something - get in quick so you don't miss out. 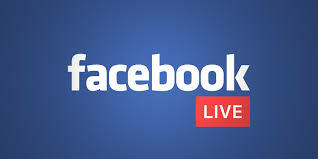 I will post a link to the retiring list on my blog at 8pm this evening. There are some other big changes coming - I will have a video to explain some of these to you as well. 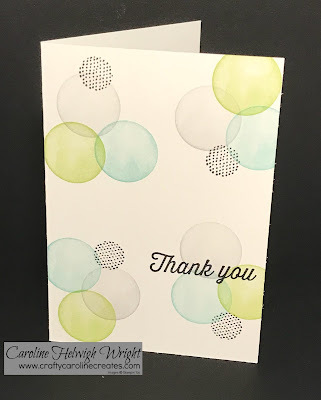 Eclectic Expression - Simple Thank You with Sale-A-Bration Free Goodies! This card is right up my street - very simple to create but quite striking. I like this card even more as it is created using a FREE stamp set! Spend just £45 on Stampin' Up goodies before the end of the month and you can choose this stamp set, Eclectic Expressions - absolutely free! I love the colour combination here - Smoky Slate, Pool Party and Lemon Lime Twist with an accent of Basic Black. I used Stampin' Up note cards which made making nearly 50 of these to send out to all of my customers last month even easier. 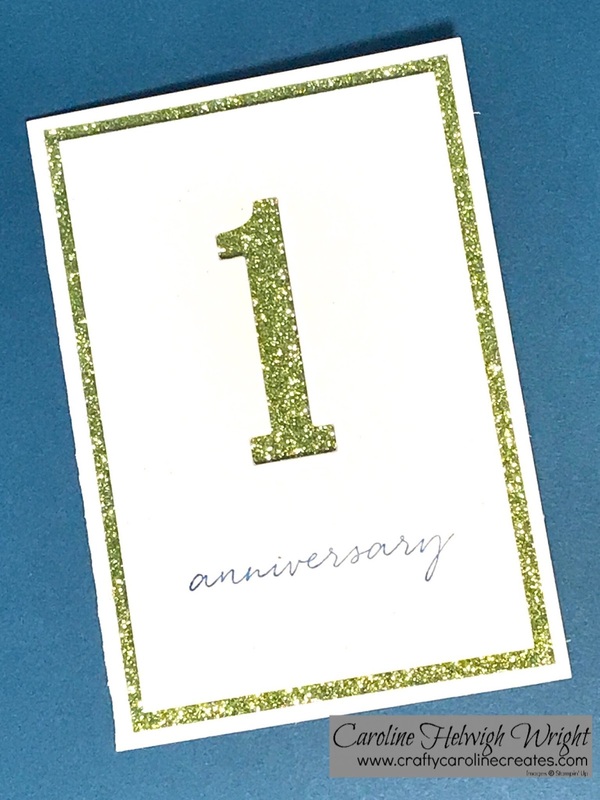 Happy Anniversary with Happy Wishes and free crafting goodies! Do you know what I like more than crafting? Would you believe that I got nearly everything needed to make this card absolutely free! All I had to add was some Cajun Craze ink and card stock and I used a Layering Oval die to crop out the oval shape. Remember you have just until the end of the month to pick up all of these goodies yourself before Sale-a-bration ends. 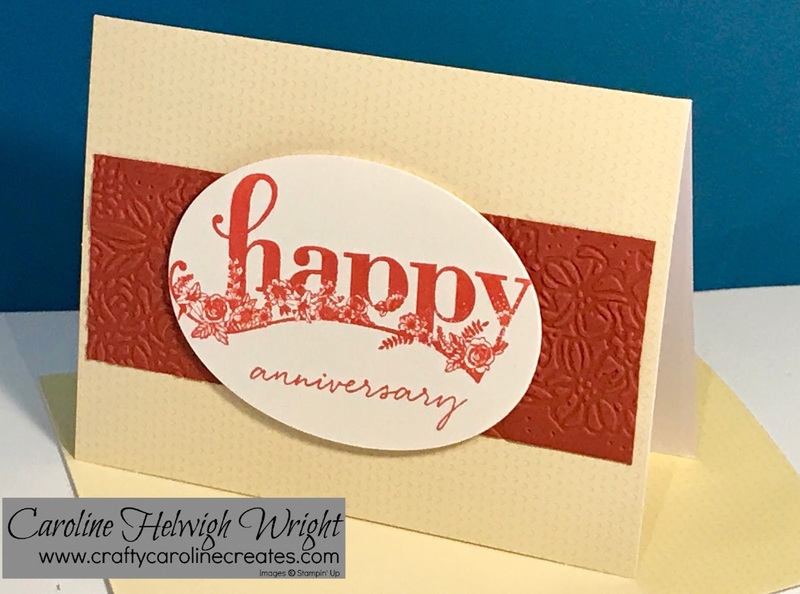 These cards went out to some of my team who were celebrating their anniversary as Stampin' Up demos. Sale-a-bration really is the best time to join Stampin' Up - you can join just to get a fabulous discount on your own orders or like me, start your own life changing business. 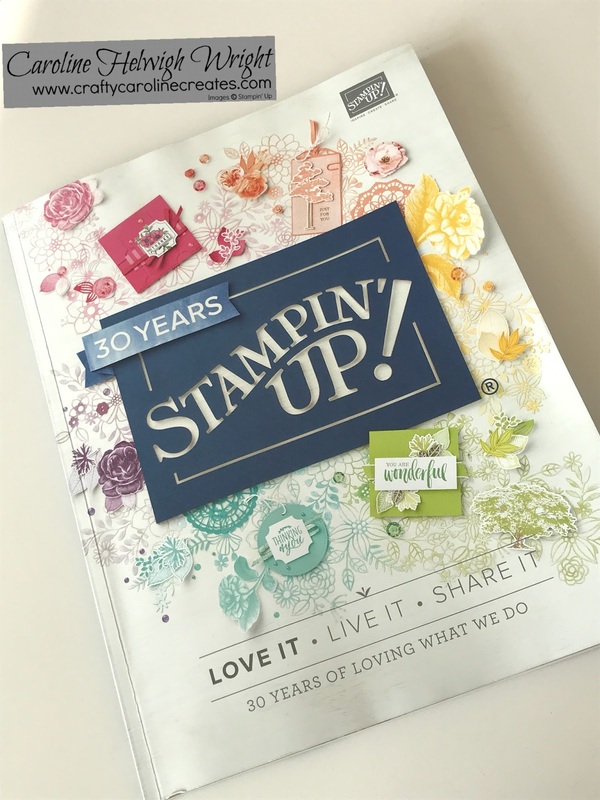 Join right now and for just £99 you can pick £130 of any Stampin' Up product of your choice plus then pick another two stamp sets - absolutely free! And postage is free too!